We’ve been working hard on Event Espresso to make it work even better for your events. In this post, we’ll cover a handful of the improvements that have been introduced to Event Espresso over the past few months. PayPal Express replaces PayPal Standard in Event Espresso 4. PayPal Express offers a similar registration experience for your guests and is more reliable than PayPal Standard as it does not use the Instant Payment Notification (IPN). This means that payments are processed on a secure PayPal.com page, and then a guest is returned to your website to view a confirmation of their registration. You no longer need to worry about a possible delay that could happen with the IPN as payments are updated immediately after a payment is completed. And you can continue to offer guest checkout with PayPal which means that your registrants/attendees can pay for their registrations without needing a PayPal.com account. PayPal Express uses a different set of credentials than PayPal Standard and here is a step by step guide on switching from PayPal Standard to PayPal Express. Would you like to show your events calendar on an external site (different site than the one that Event Espresso is running on)? Now you can do that with Event Espresso 4 and the Events Calendar add-on. 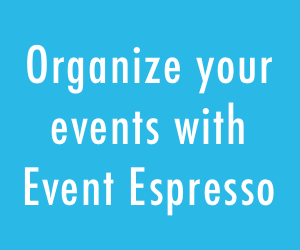 From your WordPress dashboard (WP-admin), go to Event Espresso –> Events. You’ll now be viewing the events overview screen for Event Espresso. Scroll down and look for iFrame Embed Code and then click on the Embed Events Calendar button. The Registration CSV report is the fastest way to get a list of guests for your upcoming event. Now, you can use the filter options on the page to refine the information that is shown and then create a report that just includes that information instead of all guest information. Head to your WP-admin (WordPress dashboard) and look for Event Espresso and then click on Events. Now look for the event that you are interested in and hover over it. Then click on Registrations. You’ll now be viewing registrations for just that event. The messages system in Event Espresso keeps a record of messages (email notifications) that are sent out. Now you may change how long those messages are retained through your WP dashboard (WP-admin) –> Event Espresso –> Messages –> Settings –> Cleanup of old messages. Check out our post about the new messages retention feature here. Here are just a few ways that we have improved registration checkout to help your guests get through checkout quicker. Your registrants will no longer see the messaging above which means a more focused registration experience. 3) The countries and territories list has been updated. Countries and territories that were previously missing have been added, and the states/provinces registration question is now dynamic and shows country-specific state/provinces. For example, if a registrant selects Canada, then they will only see provinces for Canada. Having trouble finding some of the new features mentioned above? You may need to update your software for Event Espresso. First, backup your WordPress site and then one-click update your software for Event Espresso from your plugins screen within your WordPress dashboard. Great to see that the CSV export of attendees is available. Would love to have the ability to export events in CSV.